By Robert A. Musson, M.D. Soft Cover, 342 pages, 8.5 x 11. Many Ohioans remember the names Leisy, Erin Brew, P.O.C., Gold Bond, Crystal Rock, Carling Black Label, Burkhardt's, Burger, Souvenir, and Renner Old Oxford Ale when thinking of local beers from their youth. But how many remember White Rock, Bula, Zest, Tuscora, Red Band, American Maid, Old Lockport, or Milt and Gold Beers? Not to mention Zepp, Reno, Perlex, and Hock-Ola beverages from the fourteen dark years of Prohibition? 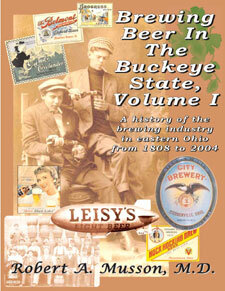 Volume I of Brewing Beer In The Buckeye State is the culmination of more than ten years of research by the author, Robert A. Musson. Building on his previous history of Akron's brewing industry, Brewing Beer In The Rubber City, this new text takes on the industry throughout the entire eastern half of Ohio. Cities covered here include Cleveland, Akron, Youngstown, Ashtabula, Sandusky, Mansfield, East Liverpool, Steubenville, Canton, New Philadelphia, Zanesville, Lancaster, Marietta, and Ironton. The modern era is not forgotten either, as more than 40 brewpubs and microbreweries from the region are included, right up to the end of 2004. All in all, more than 240 brewery sites are chronicled over 342 pages. These span the entire spectrum of the brewing industry, from Nineteenth Century tavern owners who made beer for customers in back rooms to giants such as Carling, which churned out millions of barrels of beer each year and rose to become one of the nation's top five brewers before dwindling into obscurity. Along the way, more than 400 illustrations of buildings, people, and artifacts help to tell the story. Brewing Beer In The Buckeye State is meant for anyone with an interest in beer, brewing, Ohio history (or history in general), advertising, architecture....or anyone who likes reading about the growth and development of an industry over nearly two centuries, and the people who made that growth happen....especially with some rags-to-riches stories of immigrants who came to America with only dreams and made fortunes through their hard work, innovation, and some luck (both good and bad) as well. In this modern era, it can be refreshing to remember why people have and continue to come to the United States to build new lives.